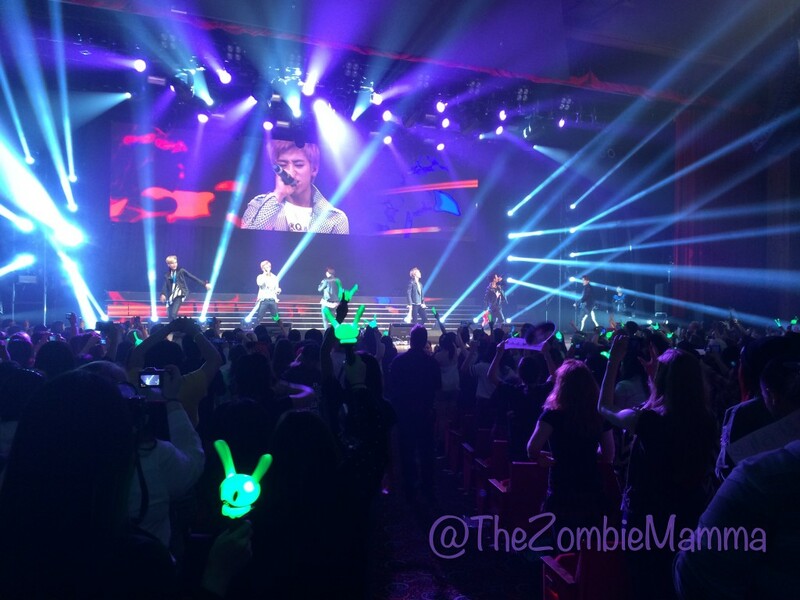 South Korean hip-hop group B.A.P invaded the northern Midwest Saturday night at the Star Plaza Theatre in Merrillville, Indiana, making their first appearance in the Chicago-land area as stop number three in the U.S. “B.A.P Attack” portion of their LIVE ON EARTH 2014 tour. 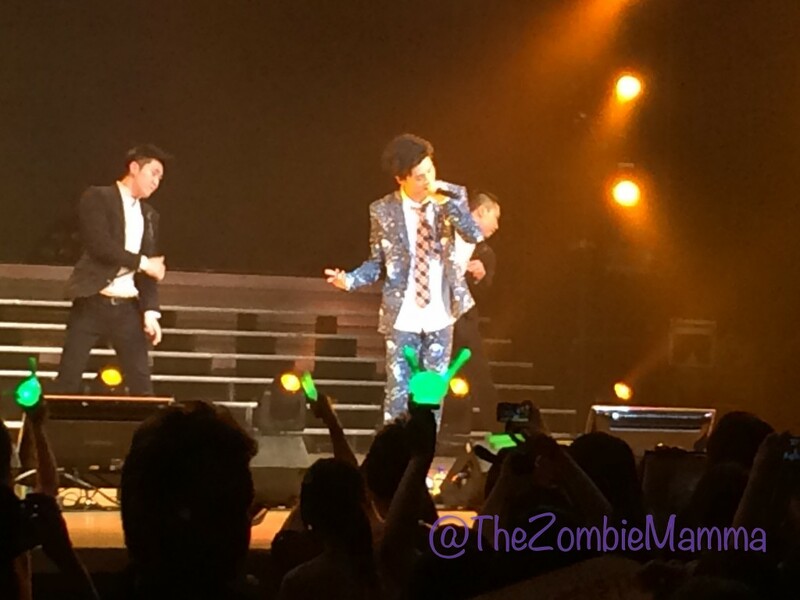 Kpop-starved fans of the group, known as “BABYz”, from the Midwest and beyond flocked to the 3400-seat theater in Northwestern Indiana for, what for many, was a once-in-a-lifetime K-Pop dream come true. Lining up outside the theater hours before the show, BABYz literally surrounded the Star Plaza Theatre, hoping to either catch a glimpse of the six-member band as they arrived, win one of the one hundred “hi-touch” passes which allowed a lucky few the rare opportunity to meet and greet the band with a quick hi-five, or just to meet up with friends and fellow BABYz. 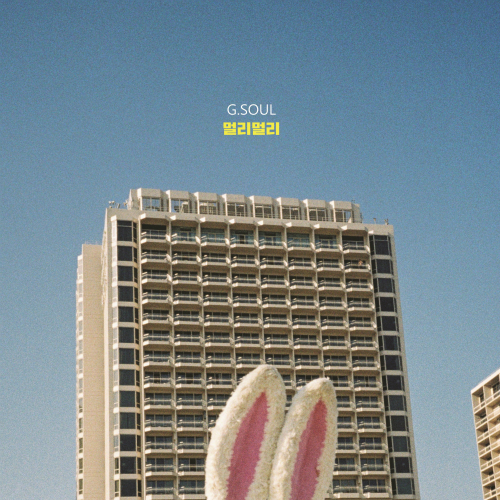 What started out as nervous anticipation quickly morphed into heart-pounding, chill-inducing excitement as the house lights dimmed and the video leading up to B.A.P’s on-stage appearance began to play. 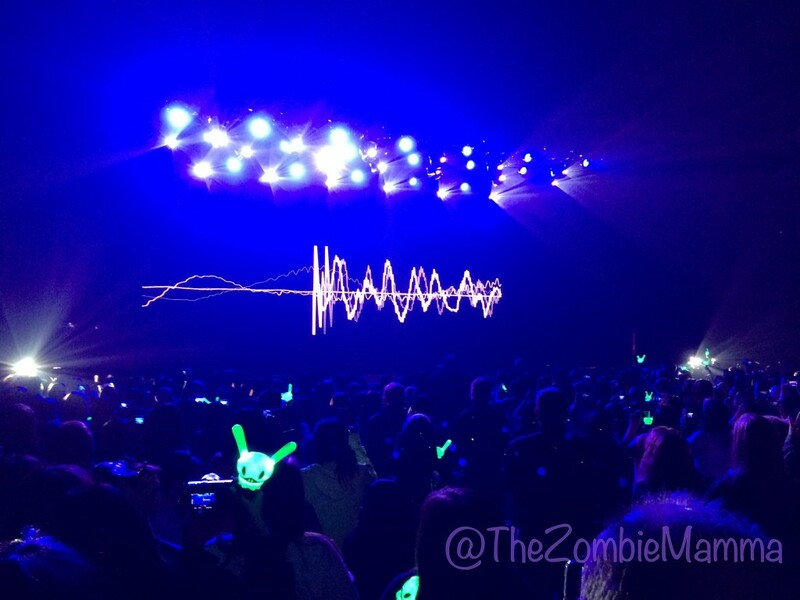 The three-and-a-half minute video brought BABYz to their feet in an escalating rush of emotions that broke into full-on fangirl crazy as the stage backdrop slowly rose to reveal the six members of B.A.P, poised to deliver one outstanding show. As if harnessing the palpable excitement of the crowd, B.A.P broke onto the stage with a performance of “One Shot” that proved, right off the bat, why these six boys are known as “Best. Absolute. Perfect.” Moving directly into “Badman,” B.A.P kept their opening strong, delivering a performance every bit as amazing as the BABYz in the audience had dreamed it would be. Reminding the audience that “Together we have power,” Bang Yong Guk and the rest of B.A.P went into an electrified performance of “Power” that ended the first song set and left BABYz clamoring for more. 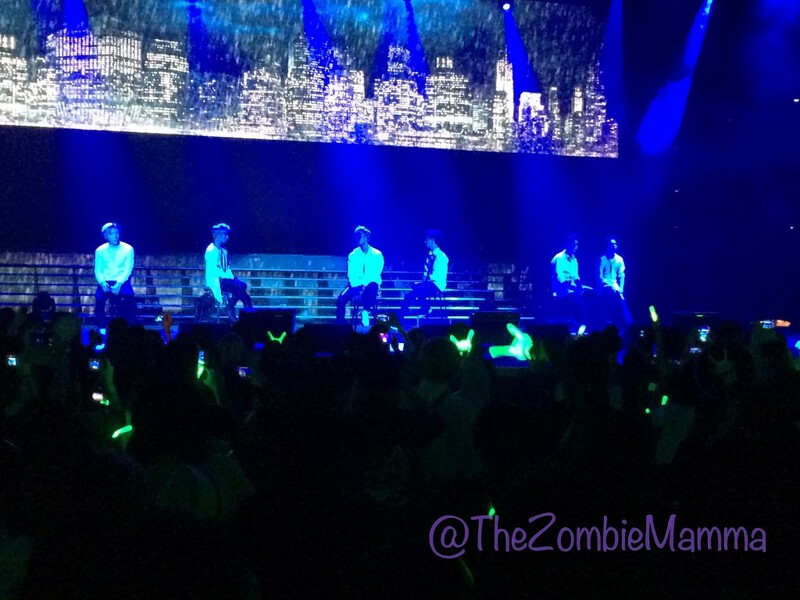 After calming the audience with their “Coffee Shop” performance, B.A.P kept things mellow by moving into one of their most recent ballads, “Body and Soul.” Being one of the most anticipated songs of the evening, BABYz were thrilled by a stirring performance that was everything they’d hoped it would be and more. Leaving BABYz breathless, B.A.P left the stage for another quick costume change before coming back with a high-energy performance of “Punch” that got the audience jumping. 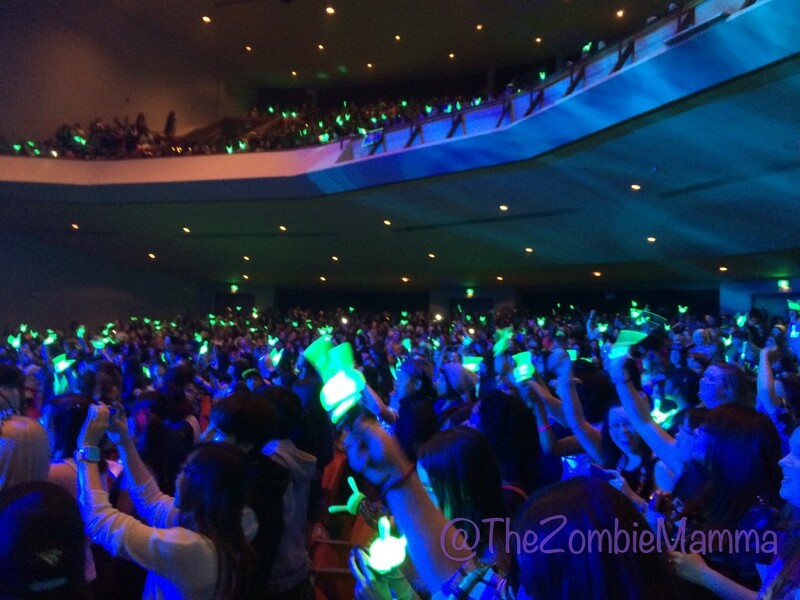 Keeping the energy in the building high, B.A.P kept us bouncing with an enthusiastic performance of “No Mercy” accompanied by an even more enthusiastic crowd of BABYz who put their newly purchased Matoki whistles to good use. 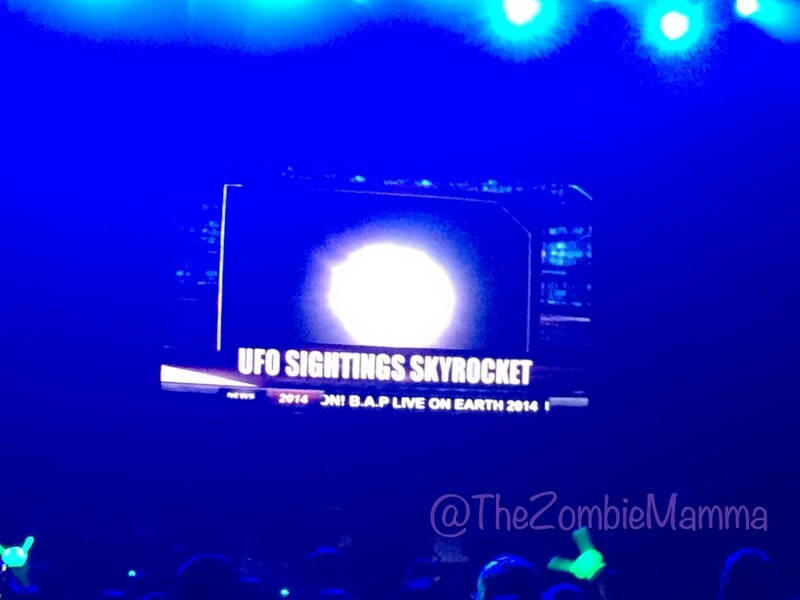 “Bang x2” was next on the set-list and once again, B.A.P left the audience screaming for more as they exited the stage to make yet another costume change. 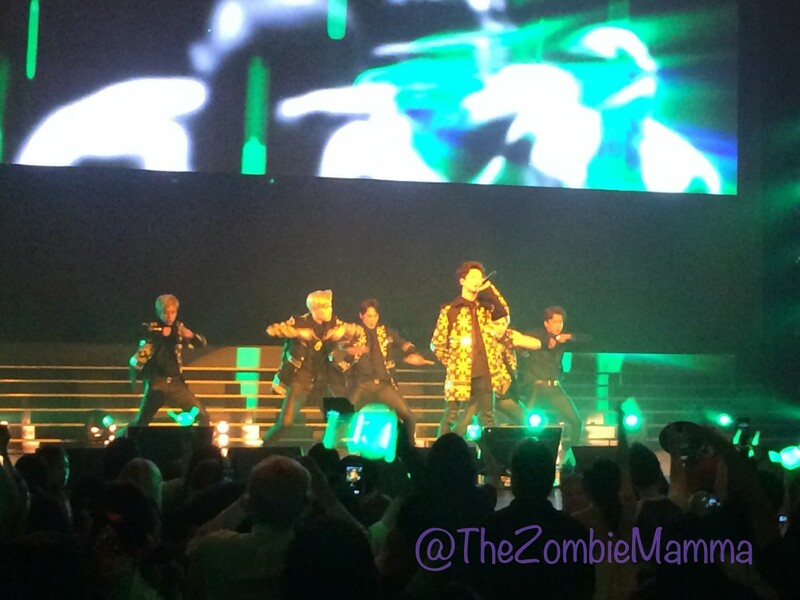 Calming things down a bit, B.A.P returned to perform “Rain Sound” before clearing the stage for Jongup’s dance solo which was ABS-olutely amazing! It seemed fitting that the song B.A.P returned to perform “Save Me” after Jongup’s solo finale left so many fangirls wavering somewhere between fainting and a heart-attack. Giving BABYz a chance to find their heads again, two horse-headed figures took to the stage to accompany a hilarious video instructing the audience how to dance an ancient Planet Mato dance that would ensure their awesomeness for the rest of eternity. 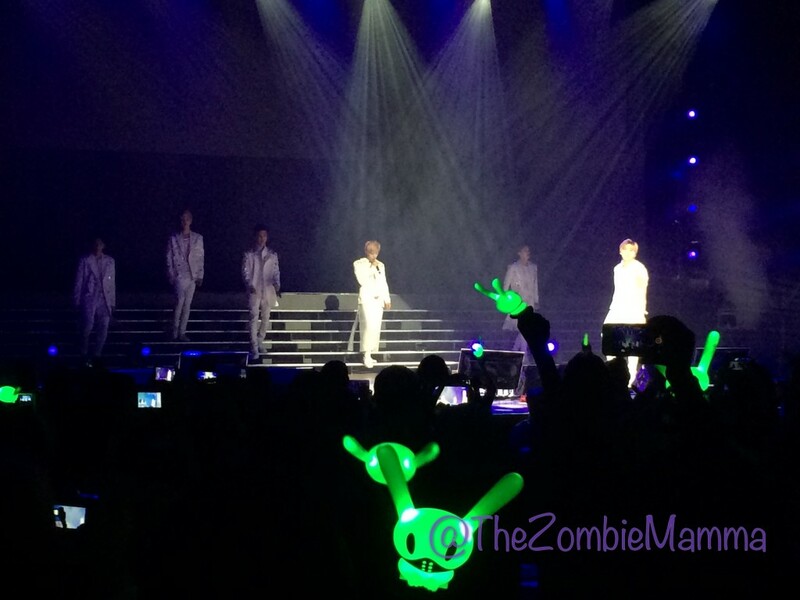 Those sweet dance moves were put to good use as B.A.P returned to the stage with those very same moves during their performance of “Check On.” Once again the audience was bouncing and Matoki lightsticks were flashing as “Excuse Me” and “Spy” finished out the set. 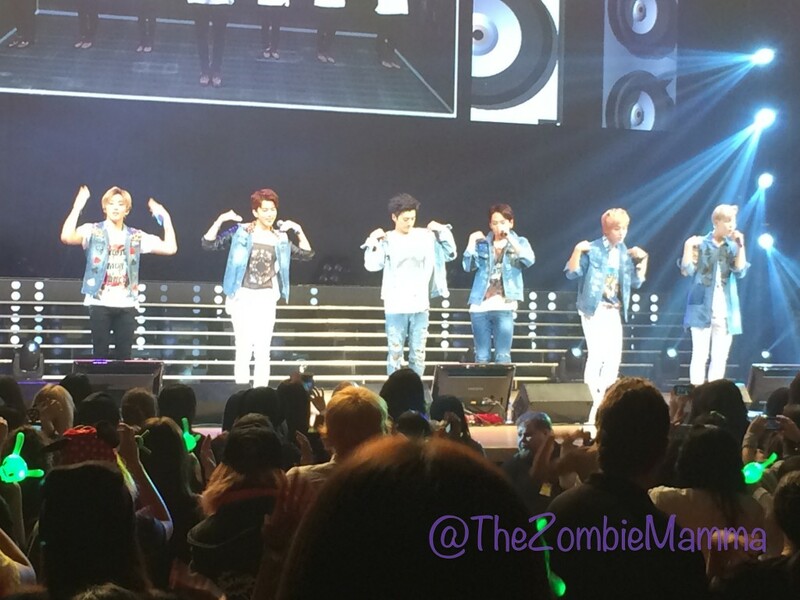 Rather than running off stage for another costume stage, B.A.P took some time to converse with the audience, sharing with us their adventures in Chicago, which included visiting the John Hancock Center and Navy Pier and eating Chicago’s famous deep-dish pizza. According to Jongup (in his best Olaf impression), “It was yummy!” B.A.P’s Youngjae went on to assure the audience that, despite the fact that “It was freezing!” they still loved their Chicago BABYz and promised to return in the future, much to audience’s delight. 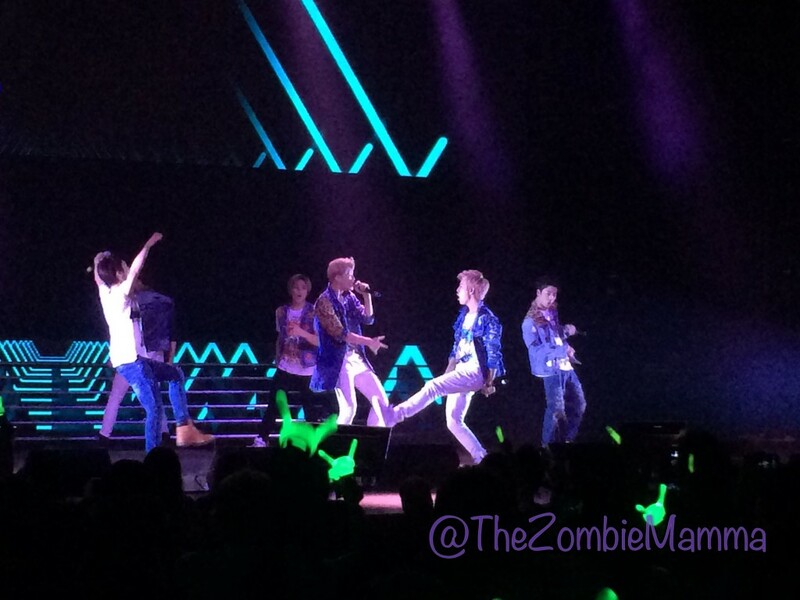 From there, B.A.P moved into the final set of the night with “Hurricane,” “Dancing in the Rain” and “하지미 (Stop It).” It was during this last set that B.A.P really let loose and had some fun. 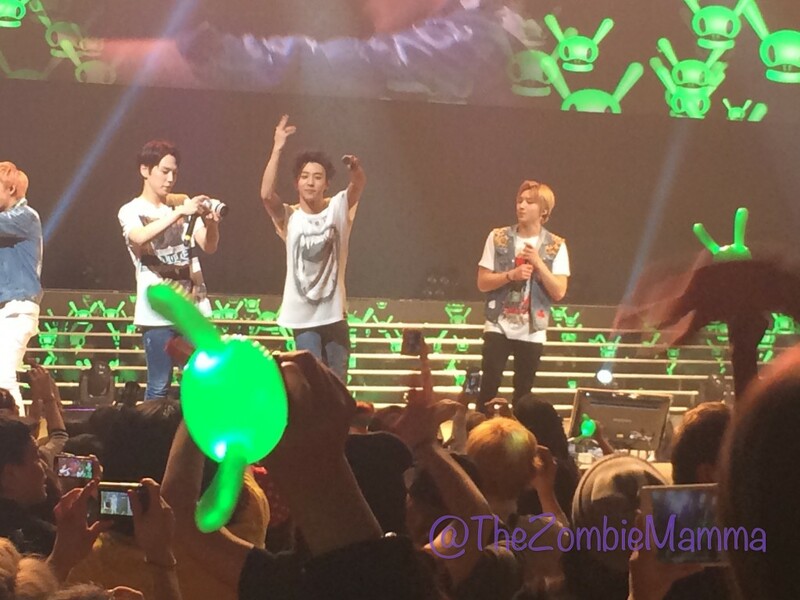 Himchan grabbed a camera from somewhere off-stage and started taking pictures of the audience while Daehyun started taking selcas with BABYz’ cell phones. While it was obvious each and every member of B.A.P was having a good time, it was Bang Yong Guk’s broad smile that really summed up the feelings of both the band and the audience. “Awesome” seems to be about the best way to describe it. 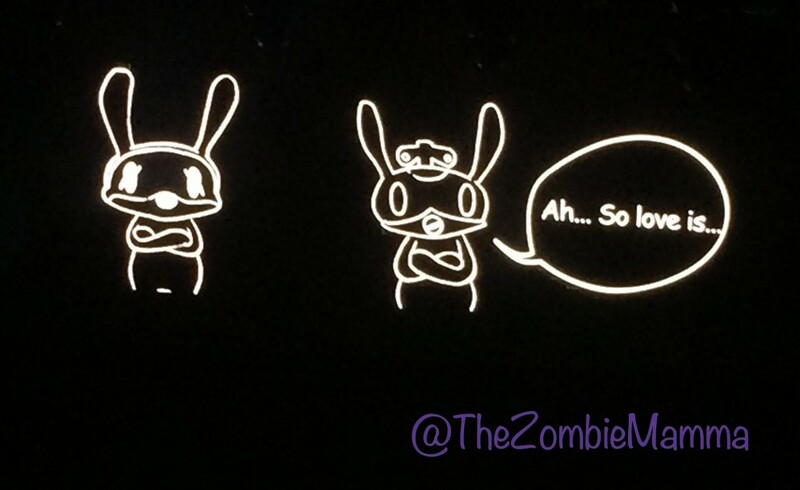 With their last goodbyes, the stage lights dimmed and B.A.P made their exit but the cheers from the audience only got louder. With smiles radiating on each of their faces, B.A.P said their last words and made their final bows to an audience that demonstrated their love for these six aliens in the only way they could, with cheers and applause that were probably heard all the way on Planet Mato. Though I can’t speak for everyone, I think it’s safe to say that every BABY in attendance will forever remember the day Chicago was invaded by these six other-worldly beings who addled our brains and stole our hearts. Thank you B.A.P for being willing to include the oft-forgotten Midwest in your tour of the U.S. and we look forward to your promised return! So exciting… I get to see them in LA tonight!!! I believe BTS is coming to Sweden soon! Yes, I know! I really really really hope that I’ll get to go!